Visor There is 1 product. WARNING! 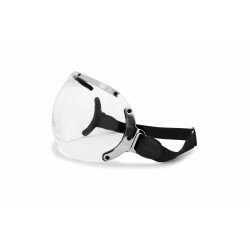 Available from 22 May 2019 Universal Helmet Visor for Jet Helmets Adaptable to any type of vintage jet helmet. Leather inserts and steel, giving a vintage look to the visor. Clear lens made of impact-resistant and scratch-resistant polycarbonate 2.4MM of thickness. Foam and leather on the internal parts to prevent helmet shell’s scratches.